What can you expect From filthy little heathens? Every European power was into imperial expansion at that time and the English were the late comers. They first resorted to piracy, but their activities were called privateering and was sanctioned by the crown. Soon they decided to capture new territories and dig for gold themselves as well get some converts as Protestants. The initial settlement in Jamestown did not go very well; a previous settlement in Roanoke had vanished without trace. They had to face harsh winters without food and eventually had to resort to cannibalism. The Jamestown colony was surrounded by 15,000 native Americans under the leadership of the Powhatan tribe who followed a matrilineal system, like the Nairs and some sort of agreement had to be reached with them for food. An incident from that voyage, which is famous even now is the affair between Pocahontas and Captain James Smith. According to the popular narrative, Smith was about to be executed by the Powhatan tribe, based on an order by Pocahontas’ father. 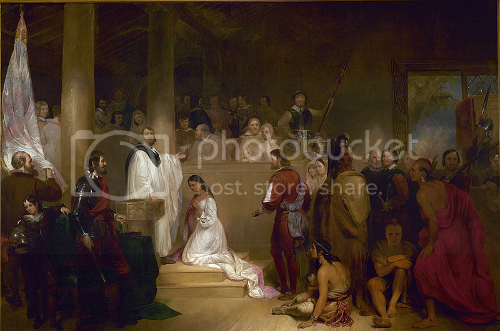 As they were about to strike, Pocahantas threw herself on James Smith and he is spared. In the Disney version, they settle in a dugout canoe and sing, while a talking raccoon fawns. According to a discussion in BBC’s In Our Time, this incident never happened. 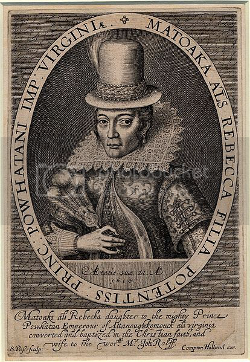 Pocahontas, who lived nearby, visited the colony often and her age at that time was around 10 which makes it unlikely that she threw herself to save a 30 year old Smith. Also, in a narrative written by James Smith in 1608, this incident is never mentioned. In another version written in 1624, seven years after Pocahontas died, this incident appears. Not just that, in his voyages, there seems to be a pattern; James Smith is saved by maidens three other times as well. Even though that tale was doubtful, even a movie made a decade back, never cast any doubt on it. One reason could be that the affair between a Native American and a White settler makes for a powerful national narrative in which the imperialism gets a smooth human face. From the Captain Smith and Princess Pocahontas (1805) by John Davis to The Indian Princess by James Barker in 1808 to Pocahontas; or, The Settlers of Virginia (1830) by GW Custis to the modern day movies, this narrative has been repeated again and again without any care for historical accuracy. Once James Smith went back to England and Pocahontas was on her way to her husband’s house, she was kidnapped by the English under Captain Samuel Argall. The Virginia Company had instructed their men to kidnap children of leaders so that they could be instructed in Christianity. During her captivity in Virginia, the 15 year old was converted and took the name Rebecca. This was a big coup for the company and she was taken to London as a sample of one who was eager to receive the gospel. London did not suit her well; she caught one of the numerous diseases and died at the age of 21.